Co-operative Education allows History students to combine traditional, in-class education with hands-on experience in the workforce. Co-op students alternate study terms at Carleton with three or four paid work terms. History students have gained real world experience and have made valuable connections in a wide range of workplaces, particularly in the public service. Our students have recently completed work term placements at: Global Affairs Canada; Indigenous and Northern Affairs Canada; Canada’s Sports Hall of Fame; Library and Archives Canada; Archives and Research Collections, MacOdrum Library; Canadian Heritage; Revenue Canada; Public Services and Procurement Canada; and many other institutions. Undergraduate students can enter the co-op program in one of two ways. Students can apply directly from high school or CEGEP or during their first year at Carleton. History students would be eligible to start their first work term in the fall of their third year of study. Want to learn more about the Co-op program? 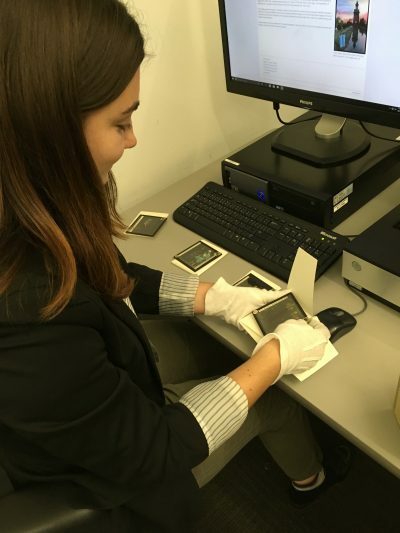 As part of her co-operative education placement with Carleton University Library’s Archives and Research Collections, undergraduate student Chloe Dennis was charged with creating an online exhibit that would highlight the collection of lantern slides—that is, photos or images that were printed on glass and projected with light. This collection of lantern slides was donated to the archives by John William Foster, who acquired the slides as part of his research into Christian missionary work in China. Used as an educational and recruitment tool by Canadian churches and missionary groups in an effort to generate interest in their missions in China, these striking images of are now the focus of a web exhibit. Just a few months ago, Dennis had never even heard of lantern slides. Now she’s curated a new exhibit that dives deeply into their use as an educational tool. Here she answers a few questions about her current co-op work term (Fall 2017) and the work that went into that exhibit. Tell us about the work that went into curating this exhibit. What were you tasked with? I was tasked with creating an online exhibit that would highlight the collection of lantern slides received from John Foster. A large part of my research for this collection came from the donor’s (Dr. John Foster) 800-page PhD thesis on the topic. In order to create an exhibit to introduce the collection I had to include only a small amount of information. I had to think of what I wanted to present and how to organise that information. First, I introduced the exhibit, its origins, and the information I wanted to cover. 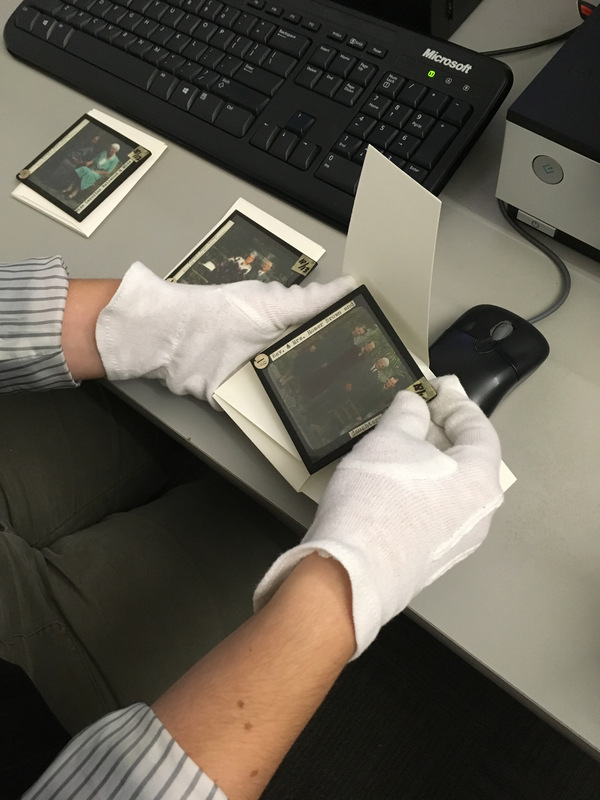 Then I gave a brief introduction to lantern slides—that is, what they are, how they are viewed, their history, and the like. I was then able to talk a bit more specifically about the collection itself. The lantern slides are organised by geographic regions in China (North, South and West), so I decided it would be best to present them and the information in this way. I wrote about each mission: the North Honan Mission, the South China Mission, and the West China mission, and included some of the corresponding slides to show where the images came from and their context. I concluded the exhibit by summarising the information and encouraging people to come and consult the physical collection in the library. I drew on the ARC’s other exhibits and my own creativity in order to create an exhibit that was fluid and informative. What was the most challenging or rewarding aspect of putting this exhibit together? The most challenging aspect of creating the exhibit was deciding what to include and what not to include. After all, Dr. Foster’s material was voluminous. During the process, I came to realise that this exhibit is meant to introduce the collection, and not to include all the information we have. The purpose is in fact to encourage researchers to come in and explore the materials themselves and to learn about the topic just as I did. The most rewarding aspect of the exhibit was seeing it all finished and up on the ARC’s website. As well, knowing that Dr. John Foster appreciated and liked the work I had done meant a great deal to me. Are there aspects of the training you received as part of your undergraduate training in the History department that proved useful while on the job? What were you least prepared for in your new position? Every task I do at the ARC involves research and writing. In the History program I learned how to find useful sources and how to read, interpret and critically assess those sources. As well, I learnt how to take the materials uncovered by my research, organise them, and to express my ideas clearly. What advice would you offer to students considering the co-operative education option as part of their undergraduate History degree? I would advise students to definitely do it. It will give you the head start you need when graduating and can offer you many opportunities while still in your undergraduate degree. I would also advise students to make connections with their professors because these connections can help them with their degree but also with their co-op job search. 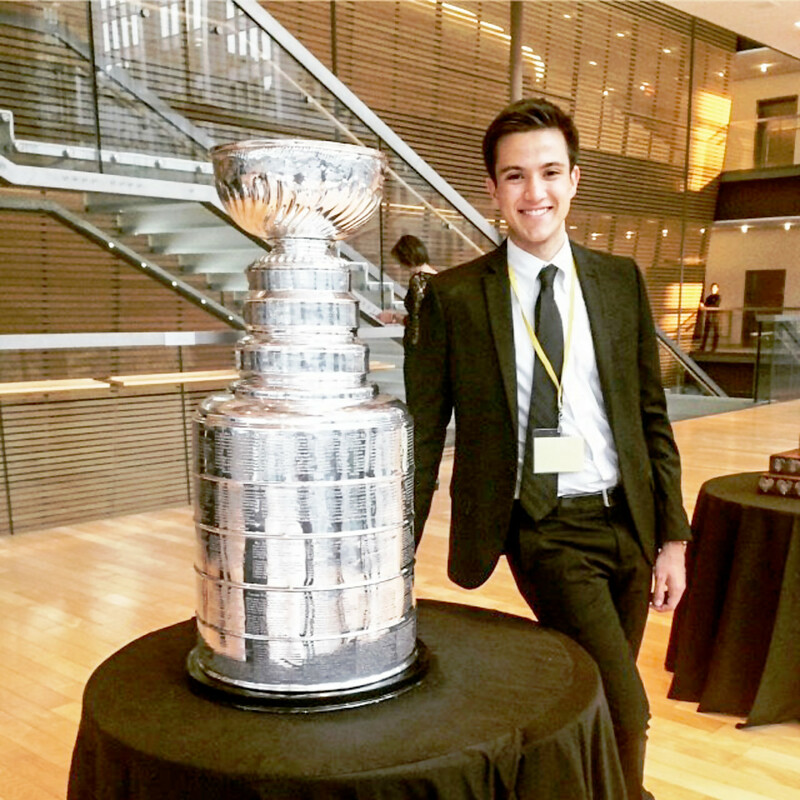 History co-op student Christian Cioffi describes some of the “behind the scenes” work that went into constructing a new temporary exhibit on horses in sport and other aspects of his summer 2017 placement at Canada’s Sports Hall of Fame. Tell us about Canada’s Sports Hall of Fame. What kind of work did you do there? 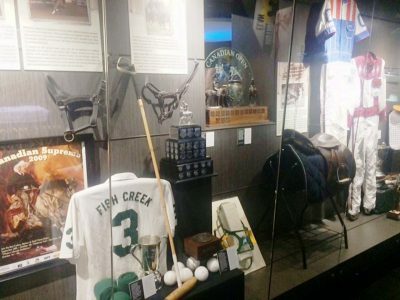 Located in Calgary, Alberta, Canada’s Sports Hall of Fame (CSHOF) is a national sports museum that celebrates the stories and achievements of Canadian athletes across a wide variety of different sports. 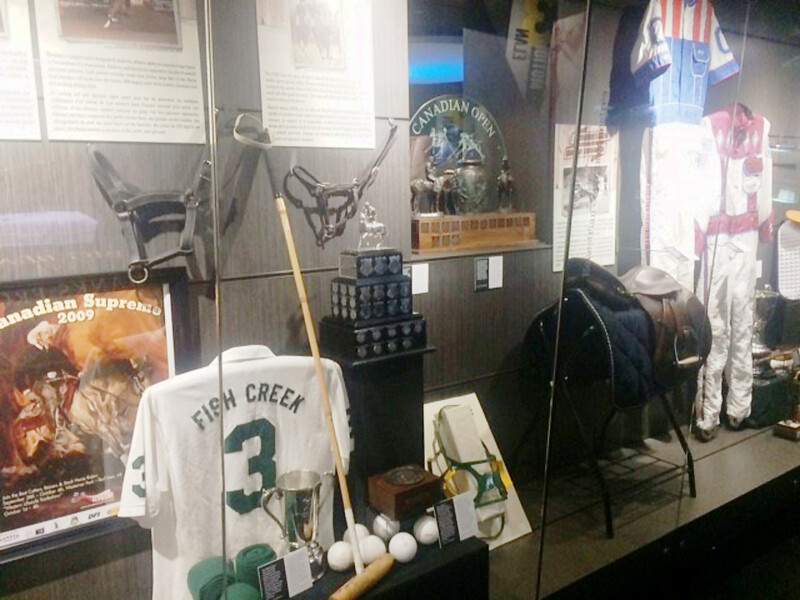 This small museum is a vital repository for inspiring stories of Canada’s athletic community. As a Collections Management and Exhibit Assistant, my primary responsibility was helping the Director of Collections and Exhibits to maintain the museum’s entire artifact, photograph and archival collection. I also undertook specific assignments to accept new artifacts as donations and loans in order that they might be displayed in the museum’s galleries. Along with other curatorial summer students, I was also tasked with constructing a new temporary exhibit titled Horses in Sport. 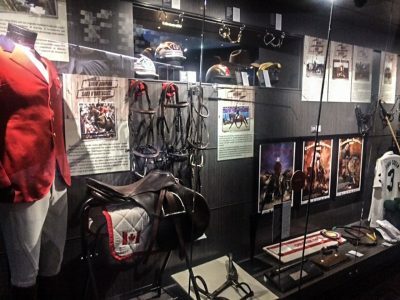 This exhibit explores various equestrian and other horse-related athletic events and highlights Canadian contributions to each. Overall, my work at CSHOF was centered around the museum’s “behind the scenes” work. I completed tasks that are invisible to the public eye, but integral to the proper operation of the museum. Of the many tasks that you undertook during your work term, was there one that was the most challenging or rewarding? Completing the Horses in Sport exhibit posed three main challenges. First, this was an ongoing project that lasted over a month and required a ton of effort to make sure that it was completed on time. Second, this required working closely with other employees. Third, this project involved many small, time-consuming tasks. It was therefore important for us to coordinate our work effectively in order to ensure that all required tasks were completed. Though challenging, this project was also the most rewarding. Not only did completing the exhibit provide a sense of relief and accomplishment, it was also incredibly rewarding to take a step back and view the completed exhibit. As opposed to some other projects in other work environments where individual contributions may be obscured from public view, the completion of Horses in Sport provided us with a clear piece of evidence of our contribution to CSHOF’s mandate. Are there aspects of the training you received at Carleton—or in the History department specifically—that proved useful while on the job? What were you least prepared for in your new position? I think that the History Department’s most significant contribution wasn’t necessarily in the content of specific classes, but in the independent nature of a history program. By having many individual projects and assignments, history classes often force us to multi-task and manage our time wisely. When these skills and experiences were applied to a professional environment, it helped me complete different tasks and projects simultaneously, making it easier for me to effectively contribute to the needs of the CSHOF. For this position at CSHOF, I think I was least prepared for the minute details of specific tasks. There was sometimes a bit of a learning curve while adjusting to the expectations of a new position. Despite these occasional difficulties, such challenges were not insurmountable and became easier with time and experience. Are there ways in which your work experiences have affected or shaped your work in classroom? 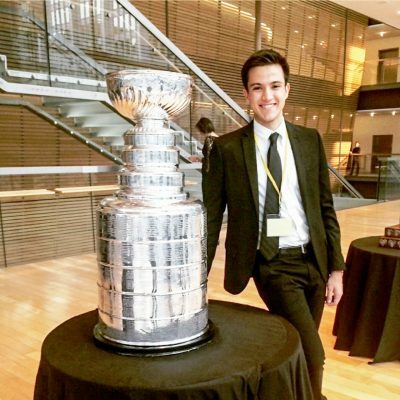 Are there lessons learned from the work world that you’ve applied upon your return to Carleton? My work term at CSHOF demonstrated the importance of taking the time to get adjusted to new environments and new experiences. This is really important in the classroom as well. As students, whether it be a new course or a new extra-curricular activity, we are often exposed to new environments, with which we are not always comfortable. Though I will admit I still have a lot of work to do before I can become “comfortable with the uncomfortable,” I think that this professional experience will help me adjust to many future new academic environments and new situations on campus at Carleton. To anyone thinking about pursuing a co-op option, I would say that while you may not find your “ideal” job or a position that is a perfect fit for your career goals or interests, the co-op program is still incredibly valuable. It allows you to take a few first steps in the transition from an academic to a professional environment. It gives you a glimpse into a wide variety of potential careers that you might be able to pursue. It also provided vital job search skills, such as resume and cover letter writing and interview practice. Ultimately, the co-op program is incredibly beneficial, simply because it opens doors for the future and allows you to experience new environments and become “comfortable with the uncomfortable”.